When it comes to easy appetizers, you can't go wrong with this Easy Bacon and Corn Spicy Cheese Dip. 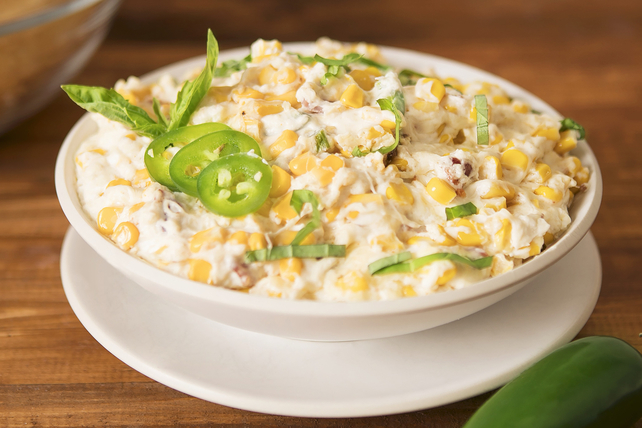 Flavoured with jalapeño cream cheese, this hot corn dip is irresistible. And as a plus, it can be ready in just 30 minutes. Mix cream cheese product and Worcestershire sauce in medium bowl until blended. Add remaining ingredients; mix well. Spoon into 1-L casserole dish sprayed with cooking spray. Serve with assorted cut-up fresh vegetables and/or baked tortilla chips. Top with sliced jalapeño peppers and fresh basil before serving.